Image of Newton Knight and fellow guerrillas from the movie "Free State of Jones"
Ever hear the name Newton Knight, or the First Alabama Calvary? Not likely. The capitalist media, books, movies & TV, has always promoted stories of “former Confederate soldiers” who loyally served the Confederacy, just loved Gen. Robert E. Lee, had no issue with slavery, and so on. But there is another story, a hidden history, of poor white opposition to the Confederacy and to slavery. Newton Knight was a poor white farmer who led a guerrilla band of “deserters” who fought the Confederacy tooth and nail. 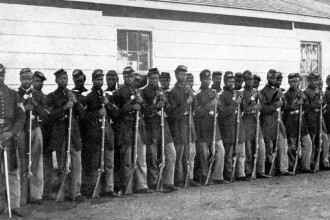 The First Alabama Calvary were anti-slavery pro-Union cavalry, mostly white but also Black, about 2,000 in total, who fought the Confederacy and eventually were escorts for Gen. Sherman during his historic march thru Georgia in 1864. But hardly anyone has heard of them. A movie “Free State of Jones” starring Matthew McConaughey, about Newton Knight was shown in theaters last summer. It is an excellent and generally accurate portrayal of a guerrilla war against the Confederacy in Mississippi. But the movie got negative reviews, almost no publicity and lost $25 million. Hardly anyone heard of it. This was no accident. By far the greatest opposition to slavery was the enslaved people themselves, who always had escape in mind, aided both the Union army and Confederate deserters, fought for the right to fight the Confederacy, and heroically fought for their freedom at every turn. But there was also significant opposition to the Confederacy from poor whites in every slave state. Newton Knight, the leader of a guerrilla group who fought the Confederacy and declared the “Free State of Jones” in Jones County, Mississippi. In 1921, Knight, aged 84 and living in obscurity, called on a Meigs Frost, a reporter for the New Orleans Item, to tell his story and “get the true facts about Jones County during the war.” His life story was recorded in a biography, “The State of Jones” by Sally Jefferson and John Stauffer. Mississippi, a land of large plantations and small farms, was the largest cotton producing state in the South due to the back-breaking forced labor of enslaved people. It was a land of rich slave owning aristocrats, 500,000 slaves, and poor white farmers. Jones County, MS contained some of the poorest soil and poorest farmers in the state. It also had no sympathy for the slave owners. In 1861 the vote in Jones County was overwhelmingly for the anti-succession candidate. But the delegates in Jackson, MS represented only the powerful, not the popular, and Mississippi was the second state to succeed. Many suspected of Union sympathies were lynched; it was a reign of terror. Newton Knight, well known for his anti-slavery views, joined the Confederate army under threat of arrest, and served as a hospital orderly, deserting soon after. He hid out in the swamps of northern Mississippi, learning what life was like for a runaway slave, and that slaves always aided Confederate deserters. He wasn’t captured without a fight. Manacled, flogged and taken to prison, Knight was given a choice; fight for the Confederacy or face a firing squad. But it wasn’t long after that he deserted again, after Vicksburg fell to the Union. This time Knight found company with large bands of fellow deserters, and organized. According to Jefferson and Stauffer, “The Newton Knight who returned to Jones County after Vicksburg was a strike-first killer and dedicated enemy of the Confederacy.” As many as 200 in number, the former solders elected Knight their captain, calling themselves “The Jones County Scouts” and declared independence from the Confederacy renaming their county “The Free State of Jones”. Every enslaved person risked life and limb to help, particularly Rachel, a slave who married Knight after the war. According to Jenkins and Stauffer “They had an agreement, she would provide him with food and he would work to secure her freedom.” Knight was as good as his word. They eventually married, and Knight committed a“crime” in post-Reconstruction Mississippi by recognizing their children and fighting for their right to attend school. Rachel and Newton were buried together outside a cemetery because it was also “illegal” to have integrated cemeteries at the time. The Confederacy responded with fierce repression. The slave-owners’ army tried to force the guerrillas out of the swamps by torturing their families, ruining their farms, stealing their food and animals and beating their wives and children. An entire regiment of about 500 soldiers were sent to terrorize Jones County. Ten guerrillas were lynched, left hanging as a warning to others. But as soon as the Confederate army left to other war fronts, the Scouts reorganized. Eventually 53 scouts escaped to join the Union army . Newton Knight must rank among the heroes of the Civil War. Thousands of poor whites throughout the South followed Newton Knight’s example and became pro-Union. It is no accident that his story was drown out in the mythology of the neo-fascist post-Reconstruction period. Along with the racist myth of the “happy” slave of Disney cartoons was the myth of the “100% loyal, racist, poor white farmers” of the Civil War South.